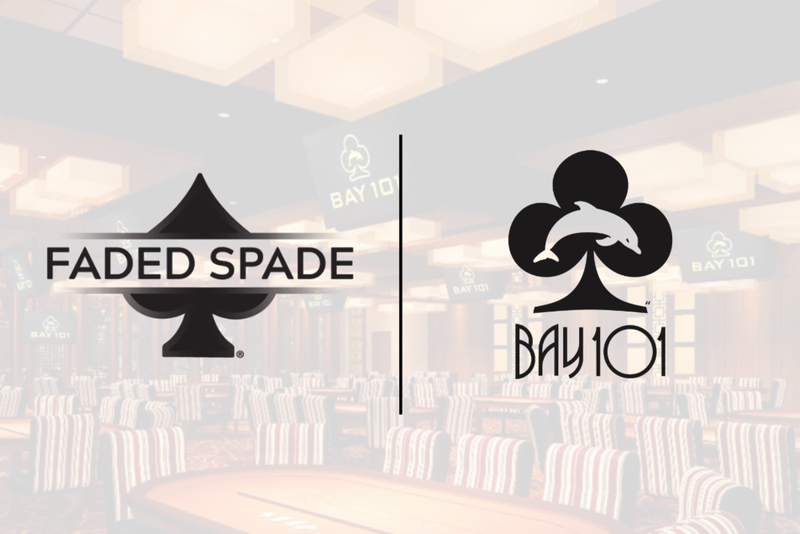 LONGWOOD, FLA (1/28/19) - Faded Spade® playing cards are set to make their Northern California debut as Bay 101 will become the first California casino customer to offer Faded Spade cards at its poker tables on a full-time basis. Faded Spade playing cards will be used in poker tournaments and cash games, and timing will closely align with the return of Bay 101 Casino’s famous Shooting Star tournament. A flagship poker room in California, Bay 101 recently completed a $50 million expansion, elevating the venue with stylish, modern design, new dining options, and 49 action-packed gaming tables. The famed Bay 101 Shooting Star poker tournament is set to return March 17-22, with three featured events. The schedule is headlined by the $5,200 buy-in Bay 101 Shooting Star tournament, taking place March 19-22, in which a select group of players, deemed “Shooting Stars,” carry a $2,000 bounty. Chip leaders at the end of Day 1 and Day 2 receive a $5,000 bonus prize, and the tournament moves to a six-handed format with 36 players remaining. For more on the event, visit www.Bay101.com. To learn more about Faded Spade, including how you or your poker room can purchase Faded Spade playing cards, visit FadedSpade.com. Faded Spade® is the poker and playing card brand for today’s poker players and the modern poker era. Founded in 2017 by Tom Wheaton, Faded Spade provides the highest quality playing cards to leading poker rooms, operators, and consumers around the world. Faded Spade playing cards feature a fresh and modern face-card design with a custom poker index and flexible yet strong 100% plastic quality to ensure longevity. As the preferred playing cards of the World Poker Tour, Faded Spade is a brand built by poker players, for poker players, with product feedback from some of the best players and poker room operators across the globe. The company is headquartered in Longwood, Florida. For more information, visit FadedSpade.com. Trademarks and copyrights owned by Faded Spade Poker Corporation. All rights reserved.